Help your patient by making changes to your listening and discussion skills. Ken Resnicow, PhD, discusses motivational interviewing (MI), and how it helps to elicit behavior change. Q: What are the basic principles of motivational interviewing? A: Motivational interviewing (MI) has both a spirit and a technical aspect. The spirit includes empathy, supporting autonomy, and collaboration. The technical aspects include asking effective questions, using reflective statements, and eliciting talk about behavior change from your patient. When you combine the spirit of the law and the technique, you end up with a very different communication style from what providers are used to. MI is less directive and includes less proactive education and advice. The provider is simply the "rudder," and the person with diabetes is "steering the conversation." Q: How can motivational interviewing help providers take better care of people with diabetes? A: The goal of MI is to help people find the deepest possible reasons to manage their diabetes and stay healthy. That reason could be their family, or wanting to remain independent and in control of their lives. MI style links positive health behaviors with specific values/goals, such as "I want to be a good spouse and a good parent," or "I want to feel respected at work." Advice, information, and fear are not particularly strong energizers—they have a very short half-life. 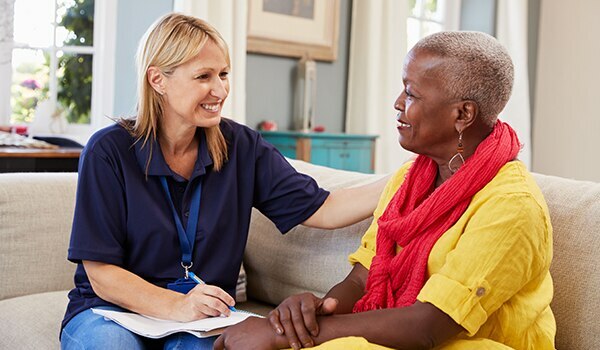 MI offers opportunities for providers to help the person with diabetes connect the dots and understand how managing their diabetes can help improve their ability to live out what they value. Providers might ask, "If you were to control your A1C, how might that affect your confidence or your sense of being a good parent?" We put the dots out there, but ultimately, we want the patient to make the connection wherever possible. Short-term benefits of MI are patient satisfaction, engagement, and retention. Long-term benefits include positive effects on A1C levels and body weight, along with reduced health care costs. Q: What could a provider say to a client whose glucose is too high from not following a meal plan or not getting enough physical activity? A: The first thing the provider would want to do is to listen and reflect back the details of their patient's struggle rather than to push, advise, or fix. We call that "rolling with resistance." You might say, "So, it's been hard for you to follow your healthy eating plan because your husband really likes sweets but doesn't like vegetables," "It's hard because your kids haven't taken to these foods," or "It's hard because it costs more." But you can't stop there, because then you'll simply have a well-empathized patient who's not doing much to make positive changes. The next phase of MI is called "building change talk." In this phase, your patient discusses the benefits that a behavior change could bring—such as better health or wellbeing—and brainstorms realistic ways to take action. Providers often ask a direct, pointed question, such as "What small steps do you see being feasible for you?" Then you might ask, "How, if at all, do you see walking fitting into your life?" Little by little, you collaborate with your patient to set a plan that he or she feels comfortable with—even slightly excited about—without offering a lot of prescription or advice. Q: What objections do you hear from providers about motivational interviewing? A: Providers worry that it takes too much time from a typical 10-15-minute office visit and is too difficult. So, we explain a few things to them. For instance, you're going to spend more time listening initially and more time helping patients accept their fears—but, ultimately, that early time commitment will pay off because any behavior change is more likely to succeed. Better behavior may translate into better health, fewer problems to treat during an office visit, and fewer trips to the doctor. Learn more about how providers make time for shared decision-making. Q: How do we know that the MI style of communication works? A: MI was almost exclusively used in addiction for the first 10 years, and then it spilled over into chronic disease and related issues of weight, diet, exercise, and medical adherence. Today, a handful of studies have looked specifically at diabetes, and hundreds of studies have examined MI for related health behaviors. Randomized trials show that, by and large, the effects of MI are positive. The American Academy of Pediatrics (AAP) currently recommends using MI to help treat pediatric obesity. And MI is beginning to be used across a range of specialties, although providers are not yet routinely trained in this communication style. AAP also has a brief MI training app for providers, called ChangeTalk. Providers who adopt MI style generally report that their patients are satisfied with this style of communication. We hear very little, if any, negative feedback once providers are comfortable using MI. When they switch to MI as their core communication style, they don't feel as frustrated; they're not advising patients as much; and they feel less strained at the end of the day. Thank you Dr. Resnicow for sharing your expertise in motivational interviewing with us. How do you encourage your patients to practice better self-management? Ken Resnicow, PhD, is the Irwin Rosenstock Professor of Health Behavior and Health Education at University of Michigan School of Public Health and Professor of Pediatrics in the School of Medicine. He is the Associate Director for Community Engagement and Health Disparities Research at the University of Michigan Cancer Center and Chief Scientific Lead at the University's Center for Health Communications Research.